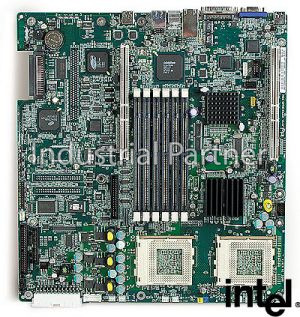 The Intel ServerBoard SCB2 accommodates up to two Intel Pentium III processors with 512-KB L2 cache, providing pow-erful performance for demanding server workloads. Two independent 64-bit/66-MHz buses, one independent 32-bit/33-MHz bus, and a Triple Peer PCI architecture enable high, balanced I/O throughput. Six DIMM sites allow for up to 6 GB ECC SDRAM for memory-intensive applications. All component locations and design are thermally optimized for 1U and 2U rack systems. The Intel Server Board SCB2 delivers outstanding reliability for high-density solutions such as application hosting, cache, messaging, multimedia, proxy, search engine, security, virtual private networks (VPN), voice over IP(VOIP) and web hosting. ATA/100 RAID Controller: Promise Technologies*PDC20267 ATA/100 IDE RAID controller provides two channels of ATA/100 IDE that can be configured into either RAID level 0 or RAID level 1; Maximum data transfer:100 MB/sec on each ATA/100 channel. Processors Supported: Intel Pentium III processors with up to 512-KB of integrated L2 cache. 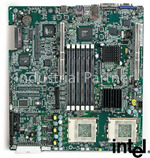 Server Board Size: 12" x 13"